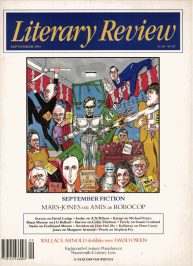 In a recent Observer article, Martin Amis reported from a location shoot for the film RoboCop 2, a science-fiction fantasy about a policeman of the future, part human and part machine. It was a characteristic piece, both sombre and hyperactive, but for once this ironist missed an irony: baby-faced juggernaut violently opposed to violence, mysterious assembly of feeling and unfeeling parts, Martin Amis is himself the RoboCop of English letters. In his new novel, Time’s Arrow, Amis’s stylistic armoury bristles as much as ever, but his purpose is disarming. He tells in strict reverse order, from death to birth, America to Europe, the life story of Tod Friendly (alias John Young, alias Hamilton de Souza, alias Odilo Unverdorben), a man who spent the war years as a doctor of torture at Auschwitz.